Parrots can be beautiful, exotic backyard visitors. While birders in Australia, Africa, and South America may have many native parrot species to attract, even birders in other locations might have feral or established parrot colonies nearby to visit the yard. With care, any backyard birder can be successful in attracting parrots. Parrots, parakeets, and lovebirds are charismatic birds with colorful plumage, playful personalities, and charming expressions, all of which make them a delight in the yard. Many of these birds, especially those that may be escaped pets, can mimic human speech, and their acrobatic antics are always entertaining to watch. They are often gregarious and may visit a yard or feeding station in flocks with a regular daily routine and feeding times. There are several types of parrots that may be regular backyard visitors. Birders who aren't fortunate enough to live within the native range of parrot species may still see escaped pets at their feeders, usually mixed in with other flocks of birds. Feral or introduced colonies of parrots may also regularly visit yards that meet their needs. By creating a parrot-friendly habitat in the yard, any birder might be surprised by one of these colorful guests. Whether local parrots are native residents, established feral colonies, or randomly escaped pets, they will seek out locations that meet their survival needs. Yards that offer parrot-friendly features will have better success attracting these birds. Food: Parrots are typically frugivorous or granivorous and may visit feeding stations where seed cakes or mixed birdseed are offered in wide, open platforms where these large birds can comfortably perch in a flock. Parrots may visit fruit trees or will be attracted to fruit on platform feeders or in large dishes, particularly sweet, tropical fruits such as bananas, mangoes, oranges, papayas, or melons. Some parrots may also sip from large nectar feeders that have sturdy perches where they can feel secure. Water: While parrot species that consume large amounts of fruit drink less, all of these birds still visit bird baths to bathe. The bath needs to be relatively large to accommodate these larger birds, and ground bird baths or low basins are typically preferred. The bath should be no more than 2-3 inches deep to encourage bathing, and the water should be kept clean and fresh. A birdbath fountain will attract more parrots with splashing sounds and the glitter of moving water, alerting birds to the available water source. Shelter: Parrots are adapted to generally tropical climates, and they will be more likely to take shelter in broad-leafed deciduous trees and bright tropical plants. In areas where parrots are native, using native plants that the birds prefer is the best way to provide shelter, but birders in areas where only escaped or feral parrots may visit will need to have more creative birdscaping to attract parrots. Planting fruit trees is another way to attract parrots with both shelter and a ready food source. Nesting Sites: Most parrots are cavity-nesting birds and require relatively large, spacious accommodations. Leaving dead trees and snags intact is ideal, though there are parrot species that will readily use large nesting boxes. Those larger boxes can easily be usurped by other birds or wildlife, however, and backyard birders must be vigilant to keep the boxes intact for nesting parrots. Providing a variety of nesting materials, especially grasses, can also help encourage parrots to nest nearby. Discourage feral cats and keep pet cats indoors and away from feeding areas. Since many parrots feed on the ground, they are more vulnerable to predators. Provide suitable perches close to feeding areas so a parrot flock has plenty of space to wait before eating. Clotheslines, branches, and even feeding poles are all suitable. Keep feeding areas and bird baths clean, as parrots can be highly susceptible to different avian diseases and an illness can quickly spread to the entire flock. Plan bird-friendly landscaping with color in mind, and choose colors that attract birds to make the yard even more noticeable to brightly colored parrots. 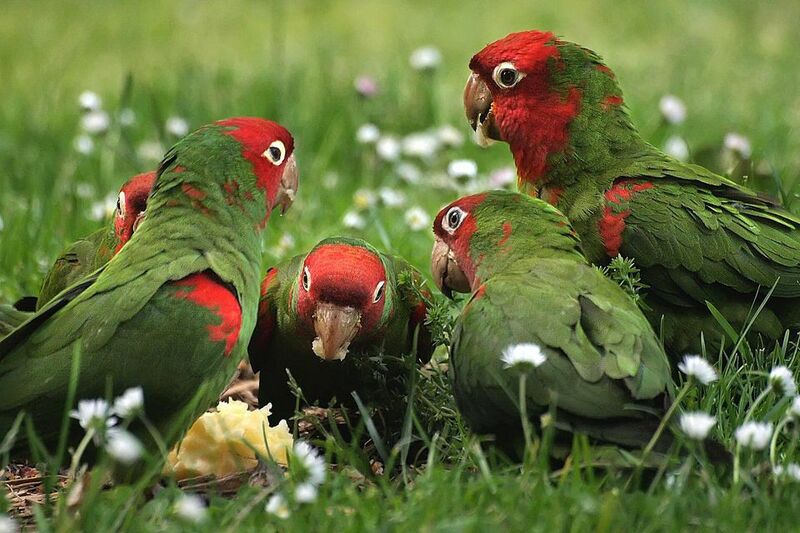 Do not leave fruit or nectar in the yard long enough to become fermented, which will cause disorientation and sickness, making parrots more vulnerable to predators. If banded parrots visit the backyard, try to read the band and report the birds, which may be lost pets or zoo escapees, to the proper authorities or rescue organizations. Parrots can be amazing backyard visitors, and even in areas where native parrots aren't abundant, every birder may have the opportunity to attract one of these quirky birds if they take steps to meet parrots' needs and make their yard parrot-friendly. Learn How to Attract Goldfinches - Fast and Easy Tips! Attract Nuthatches to Your Yard With Ease! What Are the Best Ways to Attract Chickadees to Your Yard?